America Revealed: How far will Congress go to cut spending in lieu of amending the Defense Budget? How far will Congress go to cut spending in lieu of amending the Defense Budget? Budget proposal would cut billions from aid program. 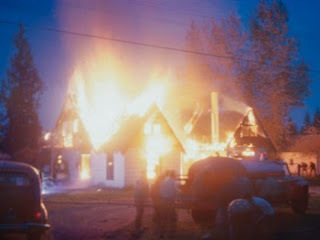 Image: House fires often break out when the poor try to warm their homes with alternates to heating fuel. It's the biggest domestic spending cut disclosed so far, and one that will likely generate the most heat from the president's traditional political allies. Such complaints might satisfy the White House, which has a vested interest in convincing Americans that it is serious about budget discipline. In 2010, Obama signed into law an omnibus budget resolution that released a total of about $5 billion in LIHEAP grants for 2011. Pointing to the increasing number of Americans who made use of the grants last year, advocates say that LIHEAP is already underfunded. The American Gas Association predicts that 3 million Americans eligible for the program won't be able to receive it unless LIHEAP funding stays at its current level. How many people, if any, might actually lose the assistance is difficult to determine. Officials were quick to point out that LIHEAP spending has grown significantly over the past several years as the government tried to keep up with rising gas prices. In 2008, the government spent $2.6 billion on LIHEAP. In 2009, the figure jumped to $8.1 billion. So the cut from that high level restores LIHEAP to something close to where it was before Obama took office. Other circumstances, such as the weather and fuel prices, could affect the distribution of benefits. "In real terms, under our budget, LIHEAP funding will be at levels similar to the Clinton administration," a senior administration official said. Still, despite the uncertainties surrounding the proposed cut, it is dramatic. LIHEAP has been semi-sacred for most Democrats and many Republicans -- a program that carries an emotional resonance as it was designed to keep poor people, particularly older poor people, cool in the summer and warm in the winter. “A lot of people in the Northeast are going to be unhappy,” an administration official briefed on the budget said. That's one reason why Republican senators like Scott Brown of Massachusetts plus Olympia Snowe and Susan Collins of Maine would probably join Democratic efforts to keep funding levels higher. Critics say that the program is poorly administered and that, contrary to intentions, it’s become a subsidy for energy companies, most of whom are prohibited by law from turning off services to delinquent bill-payers during weather emergencies. About 10 percent of LIHEAP funds are transferred to “weatherization” programs, according to a government study. News of the cut comes on the very day that the National Fuel Funds Network, a coalition of energy groups and community advocates, holds its “Washington Action Day” on Capitol Hill to call on Congress to increase funding by at least $1 billion. Republicans on Wednesday unveiled a partial list of items they’d cut from the resolution that funds the current budget year. Obama won’t cut nearly as much. Beyond the LIHEAP cut, many of Obama's proposed cuts will come from federal programs where new incentives and increased competition could provide the service more cheaply, or where a lack of oversight has created waste and inefficiency, the officials said. Since Obama’s State of the Union speech, the White House has been eager to show it’s serious about deficit reduction. It has begun to outline the cuts that would offset more spending for education, infrastructure, and research. These cuts include a $300 million reduction in community development block grants, $350 million for programs that support “grassroots” community groups, and $125 million from the Great Lakes Restoration Initiative. Collectively, those three reductions will barely make a dent in the budget, which is projected to run a deficit of at least $1.5 trillion this year. Obama has said that his proposed five-year freeze on domestic discretionary spending will save the government $400 billion. Administration officials said that government departments and agencies were asked last summer to identify ways to reduce to their top-line budget by 5 percent. Those proposals were forwarded to the Office of Management and Budget and the White House in the fall, and Obama and his team have spent the past two months targeting the least efficient programs. The OMB was particularly interested in programs that distribute money to secondary groups but lack mechanisms to evaluate how it is spent, officials said. Who Wants Grandma to Freeze? What's the administration trying to accomplish by cutting a popular program for the poor? When National Journal first reported that President Obama's budget will cut a popular home heating-assistance program for the poor, it got Democrats furious and pundits wondering. The Democratic nominee for president before Obama, Sen. John Kerry, D-Mass., denounced the proposed cut. So did Sen. Jeanne Shaheen, D-N.H., and many others especially from cold weather states. After all, the Low Income Home Energy Assistance Plan is about as sacrosanct as, say, the Head Start program for low-income children. LIHEAP helps the poor stay warm in the winter and cool in the summer. And since it's disproportionately the elderly who are reliant on the program, it engenders even more sympathy. Who wants Grandma freezing? Slashing the program's funding seems meant to prove a few things. It could show that the president is tough on the deficit. Even if the program costs just a few billion dollars and thus is minuscule in comparison to the deficit—let alone the national debt—it shows a degree of toughness on spending that no one has thus far seen from an Obama adminstration that came to office thinking that Keynesian pump priming was the only thing between America and the abyss. In a larger sense, though, the cut may signal something even larger than deficit cutting. It could be slightly analagous to President Clinton's efforts to reform welfare. When he passed welfare reform after the Democrats' midterm drubbing in 1994, many Democrats and not a few Republicans looked at it cynically as a political move designed to reposition the president for reelection. Others saw it as a more principled move. Clinton had campaigned on welfare reform in 1992, even if he had ignored it largely in his first term. He had argued that welfare as a permanent entitlement had done no one, least of all the poor, any favors, and so he famously pledged to "end welfare as we know it." Indeed, he did. The end of Aid to Families with Dependent Children was a signal event in American social policy. It's different in many respects than the LIHEAP cut. LIHEAP is popular; welfare was, at best, seen as necessary but it was always a political weight for Democrats. Clinton had campaigned on welfare reform; Obama brought this up out of the blue. Trimming LIHEAP may save some money, but no one expects great social benefits. Still, each move may force a fundamental rethinking of the president who proposed it. If Obama can end LIHEAP as we know it, then it's going to be much harder to characterize him as the crazed spender of tea party fulminations. Two very different programs and circumstances, yes, but each changes the lens through which we see the president. Interestingly, the Clinton administration itself sought to cut LIHEAP. Of course, there is a possibility that this could become Obama's "firemen first" problem. The phrase comes from Washington editor and author Charles Peters, who has noted that when cities face budget cuts, those resisting the cuts almost always point immediately to the threat of firemen losing their jobs. The idea is to create so much fear that the cuts never go through. When President Reagan proposed his budget in 1981 with cuts to the Interior Department, there were widespread leaks that the Washington Monument might have to close. (The celebrated obelisk on the National Mall is run by the National Park Service, a part of the Interior Department.) Reagan got some of his cuts and the monument was never shuttered. By offering a particuarly dramatic cut--although its actual effects of the poor are far from clear--the administration may find its allies more combative and dug in on other issues, too. If they're coming for grandma's heating oil, then what are they going to do about Social Security? Obama and the Republicans know they have to reduce a national debt that's close to 100 percent of the gross domestic product. How they get there is going to be the fascinating story of 2011, and the LIHEAP card, first unearthed by National Journal, couldn't be a more interesting way to start.